Elvis Presley, the King of Rock ‘n Roll, made history when he began his music career in 1954 with Sam Philips, owner of Sun Records. Sixty years later, you can own a piece of that history with an exclusive, limited edition “Elvis Presley 60th Anniversary of Rock n’ Roll 1954-2014” jukebox from Rock-Ola, the iconic maker of classic jukeboxes that inspired the term Rock ‘n Roll. Limited to just 99 each of either a piano black or piano white finish, with an official signed certificate of authenticity, these exclusive jukeboxes are sure to become collectibles for Elvis fans worldwide, and include a special signed brass plate with stamped Limited Edition number. During Elvis Week, one lucky fan will have the opportunity to win the black Limited Edition Elvis Presley number 80 jukebox of the series of 99. The white #80 jukebox will be added to Graceland Museum’s permanent collection. Register here. Each jukebox features distinct touches in tribute of the King, including a unique guitar-shaped CD magnet holder with Elvis Presley signature, individualized Elvis murals (’68 and ’70 designs) for each finish, an illuminated anniversary logo in the speaker grill, custom grill cloth with golden musical note, and others. 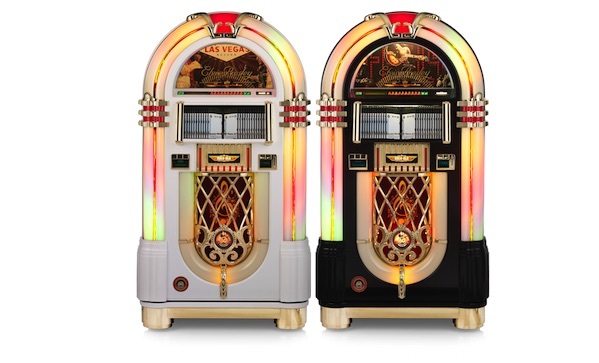 These Rock-Ola jukeboxes combine a nostalgic look and feel with the latest in digital sound technology. The jukebox comes with a 100 CD capacity carrousel, Philips compact disc player, Peavey peerless low heat amplifier, 2,000 watts RMS power, and a 5-speaker dual 3-way system for “live” performance reproduction. Each offers a 27-button full-function remote control, remote controlled night light feature, aux input to connect smartphone or tablet, and optional Bluetooth for streaming wireless music. To get yours, contact Rock-Ola at (310) 328-1306 or visit them online.